CAA has been awarded a $20,000 grant from the National Endowment for the Arts (NEA) to support the next installment of ARTspace at the 2015 Annual Conference in New York. Spearheaded by CAA’s Services to Artists Committee, ARTspace is a forum for programming designed by artists for artists that is free and open to the public. Held at each Annual Conference since 2001, ARTspace is intended to reflect the current state of the visual arts and arts education and is among the most vital and exciting aspects of the conference. Designed to engage CAA’s artist members as well as the general public, ARTspace offers free program sessions and includes diverse activities such as the Annual Distinguished Artists’ Interviews (most recently with Kay Rosen); screenings of film, video, and multimedia works; live performances; and papers and presentations that facilitate a conversational yet professional exchange of ideas and practices. The grant, which is the NEA’s sixth consecutive award to CAA for ARTspace, will help fund programs such as ARTexchange, the popular open-portfolio exhibition for artists, as well as [Meta] Mentors, a professional-development forum that has addressed such topics as making a living as an artist with and without a dealer, self publishing, social media, and alternative funding. ARTspace programming at the 2014 conference in Chicago included panels that explored the shifting landscape of the field, from the growing role of audience participation and collaboration to new models for artists’ workspaces. You can explore all of the 2014 ARTspace programming at conference.collegeart.org/artspace. 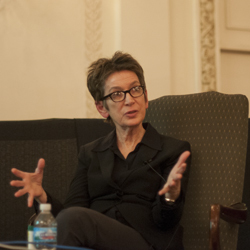 The artist Kay Rosen was interviewed in ARTspace at the 2014 Annual Conference in Chicago (photograph by Bradley Marks).